EXCLUSIVE INTERVIEW WITH THE “BILLY GRAHAM” OF IRAN: More Iranians will celebrate Easter this year as followers of Jesus Christ than any other time in history. 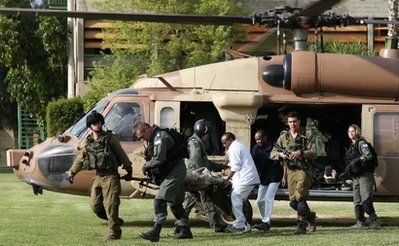 Israeli warplanes hit Hamas targets in Gaza….tensions rising….Ynet reports, “Week after two soldiers killed near Israel-Gaza border and few hours after Qassam hits south Israel, witnesses say IAF carried out at least five missile attacks on various targets; no immediate reports of casualties”….developing…. All eyes are currently on Iran and Israel. As the Iranian people just celebrated the Persian new year, President Ahmadinejad marked the celebration by urging Muslims to prepare for the coming of the Twelfth Imam and the annihilation of Israel. Western leaders are preparing to impose economic sanctions on Iran as early as next month in hopes of stopping the ayatollahs from building the Bomb, but it may be too late. A new CIA report indicates Iran already has the capacity to build nuclear weapons. Some experts say a cataclysmic war in the region between Iran and Israel, and possibly others, is inevitable. I hope not, but tensions are growing and the stakes are very high. Is there any good news in Iran today? Is God working in that historic and important country, and if so, how? How can followers of Jesus Christ make an impact on Iran with the gospel of salvation through faith in Christ’s death on the cross and resurrection from the dead? How can we pray for the believers in Iran, and for all the people of Iran? The amazing thing is: More Iranians will celebrate Easter this year — the death and resurrection of Jesus Christ — than at any other time in human history. That’s because more Iranians have renounced Islam and become followers of Jesus Christ in the last 31 years than the past 14 centuries combined. On Tuesday, April 13th, I will be speaking at a special evening event in San Jose, California for the ministry of Hormoz Shariat, whom I describe as “the Billy Graham of Iran.” We’ll be talking about these extraordinary developments and addressing these very important questions. I hope you will join us. Hormoz used to be a Radical Shia Muslim in Iran shouting, “Death to America!” when the Ayatollah Khomeini came to power in 1979 and launched the Islamic Revolution. A few years later, Hormoz came to faith in Jesus Christ. Today, Hormoz is the most widely seen and heard and effective evangelist in all of Iran. He and his team with Iran Alive Ministries reach an estimated seven to nine million Iranian Muslims each weekday night (Tuesday through Friday nights) with the gospel of Jesus Christ through his satellite TV programs. He has also become a dear friend. You may recall I profiled Hormoz in my non-fiction book, Inside The Revolution. He was also featured in the documentary film we released on 9/11 last year. In San Jose, Hormoz and I will be sharing some of the remarkable things God is doing in Iran right now and inviting people to become prayer and financial supporters of the ministry the Lord has given him. I am really looking forward to it, and would love for you to be there. You can learn more and/or register at http://www.cityteam.org/joelrosenberg/. What follows in an interview I did with Hormoz this past week, amidst finishing my new novel, The Twelfth Imam. Rosenberg: What is the number one thing that followers of Jesus Christ around the world need to know about what God is doing inside Iran these days? Hormoz Shariat: Christians around the world must know that even as the government of Iran is trying to export Islam to other countries, millions of Iranian Muslims are ready to turn away from Islam. They must know that there is a unique opportunity right now to impact Iran for Jesus Christ…. [and] now is the time to reach Iran, not when it opens politically. If Iran’s government changed and became democratic, this spiritual hunger would die down within six months to one year. Rosenberg: Why are so many Iranians renouncing Islam and becoming followers of Jesus? Shariat: The number one reason is the years of prayers of Christians for the people living in the 10/40 window (Iran is at the center of that window). Another reason is that the true nature of Islam has been revealed to many Iranians. Iran is the only country in the world led by clergy. For 31 years, the people of Iran have experienced the implementation of true Islam. Before 1979, they had a romantic view of Islam. They taught that if Islam ruled in Iran, it would be a paradise on earth. They dreamed that with Islamic government, there would not be any more poverty nor injustice. But after 31 years, they have come to realize that there is something fundamentally wrong with Islam itself. They have realized that Islam has not done anything for them individually, neither for their family, and nor for their society. For 31 years, Islam has been forced on them and yet it has not worked. So in reaction to that, they want freedom, and they do not want Islam. Rosenberg: What can you tell our readers about your ministry, for those who are not familiar with who you are and what you and your team does? Shariat: We ourselves at Iran Alive Ministries are Muslim Background Believers who have a passion to reach Iran for Christ. Our track record shows that we have been very effective in brining Iranian Muslims to Christ and planting churches among them. After planting several churches in the USA, we have been using satellite TV to bring hundreds of thousands of Iranian Muslims to Christ and have helped plant house churches among them. By His grace we are equipped and positioned to make a tangible impact for Christ in Iran through satellite TV, Internet, and underground church planting. People who need more information about us can visit our website: www.IranAliveMinistries.org. Rosenberg: What are your goals for the April 13th event in San Jose, and why should people register and attend? Shariat: Our first goal is to INFORM people about what is happening in the Middle East and how it can impact their lives here in USA. They need to know that Islam can not be ignored. Otherwise, sooner or later, events worse than 9/11 will happen in this country. Second, we want to INSPIRE them. Our goal is to alarm them, but not to put fear in their hearts. We want them to know that God is doing a great work among the Muslims in the Middle East. Third, we want to INVITE them to join us in making history in Iran for Christ. Rosenberg: With Iranians just celebrating “Nowruz,” the Persian New Year, what are the top five specific requests that followers of Jesus can be praying for the Iranian people this year? Please pray for the persecuted Christians in Iran. There are some who are in jail right now because of their faith and some are being tortured. Please pray that the spirit of Islam, which is the spirit of fear, will be bound and lifted from Iran. Once this spiritual veil is lifted, Iranian people can see the light and the truth of the Gospel and come to salvation. Please pray for the young Christian leaders in Iran who are serving God despite the fact that their lives are in danger daily. They are witnessing and starting underground house churches knowing that if caught, they could face a certain death. Pray for their protection and also for their courage. Please pray for wisdom for our ministry leadership. As the Bible says, we need to be as wiser than the serpent and as innocent as the dove. We also need to find new ways to grow and strengthen the church in Iran. Please pray against the schemes of the government to stop the growth of Christianity in Iran. They are jamming TV satellite signals, blocking and monitoring phone calls, disrupting internet connections, filtering websites, and hindering Bible distribution. >> Show your support for Israel, learn how to bless Israel and her neighbors in real and practical ways, and learn more about the work of The Joshua Fund. Register today for the 2010 Epicenter Conference in Philadelphia, June 25-26. Happy Passover! Thanks so much for helping The Joshua Fund bless needy Israelis this week. Tonight, Jewish families all across Israel are celebrating “Pesach” (Passover). I am so glad to be able to report to you that because of the faithful prayers and generous financial support of evangelical Christians throughout the U.S. and Canada, The Joshua Fund and our allies have been able to bless thousands of poor and needy Israelis in the name of Jesus this year who otherwise would not have had the food, supplies, or financial resources to celebrate the holiday. These include Holocaust survivors, other elderly Israelis, and single mothers and their children. 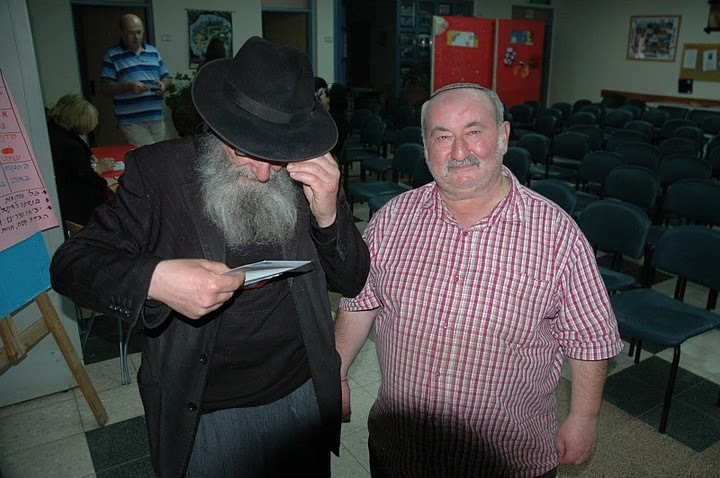 Through distribution centers The Joshua Fund helps finance and supply, some 1,200 needy Jewish families in various towns and cities throughout Israel were directly provided food and supplies for Passover this past week. In another Passover project financed by The Joshua Fund, an additional 1,600 needy Israeli families were invited to receptions over the past few days and given gift cards enabling them to buy Passover supplies at their local grocery stores. In the future, as our new warehouse becomes fully operational, we will be able to distribute more food directly, and probably not need to distribute food vouchers. But this was a way to bless many additional people this particular year. Jesus Christ commanded His followers to feed the hungry and love the poor and the needy and to do so with unconditional love. That’s what The Joshua Fund is all about, obeying the words of our Father and following the model of Isaiah and Jesus. Thank you so much for helping us bless Israel and her neighbors in the name of Jesus. May the Lord bless you for your faithfulness. HELP US BLESS IRAN WITH THE GOOD NEWS OF JESUS’ LOVE THIS NEW YEAR: Iranians just celebrated the Persian new year. President Ahmadinejad marked the celebration by urging Muslims to prepare for the coming of the Twelfth Imam and the annihilation of Israel. On Tuesday, April 13, I will be speaking at a fund-raising event in San Jose, California for the ministry of Hormoz Shariat, “the Billy Graham of Iran.” Hormoz reaches seven to nine million Iranian Muslims each weekday night with the gospel of Jesus Christ through his satellite TV programs. Please register to come to the event. Hormoz and I will be sharing the remarkable things God is doing in Iran right now, and I would love for you to be a part of it. You can learn more at http://www.cityteam.org/joelrosenberg/ or on my weblog. Thanks and God bless you. CONGRESS VS. WHITE HOUSE ON ISRAEL ISSUE: Meanwhile, the contrast between the pro-Israel end of Washington, D.C.’s Pennsylvania Avenue (Congress) and the hostile end of Pennsylvania Avenue (the White House) continues to become sharper.While only 9% of Israelis believe President Obama is pro-Israel, “nearly 300 members of Congress have signed on to a declaration reaffirming their commitment to ‘the unbreakable bond that exists between [U.S.] and the State of Israel,’ in a letter to Secretary of State Hillary Clinton,” reports Haaretz. >> Show your support for Israel, and learn how to bless Israel and her neighbors in real and practical ways. Register today for the 2010 Epicenter Conference in Philadelphia, June 25-26. CALLER CITES THIS WEBLOG ON RUSH LIMBAUGH SHOW: How will you bless Israel today? Hey, special thanks to “Julie in Buies Creek, North Carolina”! She is a faithful reader of this weblog. Today, she called into the Rush Limbaugh Show and asked Rush to comment on this weblog regarding how much pressure President Obama is putting on Israel to divide Jerusalem, and his efforts to build an alliance against Israel. Here is the link to the mention on Rush Limbaugh’s website. God bless you, Julie, for getting engaged in the debate to bless Israel. I hope others will get engaged, as well. Join our “Epicenter Team” on Facebook for action alerts, prayer requests, and the latest news from Israel and the Middle East. Call radio talk shows to defend Israel and explain — gently and respectfully — why the administration is wrong to pressure Israel to divide Jerusalem and give up more land. Call, write and/or email the White House to express your opposition to the President’s unfair and unwise attacks on Israel and to urge the administration to reverse course and bless Israel. Call, write, and/or email your Member of the House of Representatives to express your opposition to the President’s unfair and unwise attacks on Israel and to urge the administration to reverse course and bless Israel. Call, write, and/or email your Senator to express your opposition to the President’s unfair and unwise attacks on Israel and to urge the administration to reverse course and bless Israel. Register to come to the 2010 Epicenter Conference this summer in Philadelphia to learn more practical ways to bless Israelis and Palestinians in the name of Jesus. Make a tax-deductible donation to The Joshua Fund, our non-profit organization that educates Christians in North America and around the world about God’s love and plan for Israel and the people of the epicenter, and provides food, clothing, medical supplies and other humanitarian relief to the poor and needy in Israel and the Palestinian territories. EXCLUSIVE: WHAT’S HAPPENING BEHIND CLOSED DOORS IN THE OBAMA-NETANYAHU MEETINGS? NETANYAHU STOOD HIS GROUND. 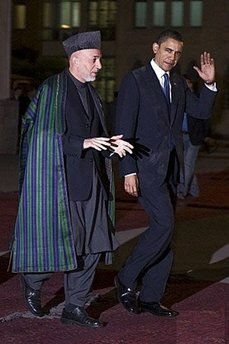 (First posted: Washington, D.C, March 24, 2010, 9:35pm eastern. Updated at 8:15am, March 25) — What in the world was going on behind the scenes of the Obama-Netanyahu meetings? Why were the talks so tense, and so shrouded in secrecy? Wednesday night, I was able to gain some clues. It’s not good. The Obama administration has been applying intense and unprecedented pressure on the Netanyahu government to make huge unilateral concessions to the Palestinians even before direct peace talks begin. One advisor who has been briefed on the talks told me: “President Obama is insisting that Israel sign a document that specifies Israel’s commitment to a peace deal with the Palestinians that will be based on 1967 lines. This means no building in Jerusalem, and a time table to address other core issues, like the ‘right of return. '” The source, one that I trust a great deal, also noted that President Obama spoke by phone in the last 24 hours with German Chancellor Angela Merkel, French President Nicolas Sarkozy, and British Prime Minister Gordon Brown to make sure each of them are on board with pressuring the Israelis to make such unprecedented unilateral concessions. The White House apparently wants the document to become the blueprint for final status negotiations, even though the Palestinians refuse even to come to the table and sit down face-to-face with Israeli leaders, including Netanyahu. The Netanyahu team delayed their departure out of Washington Wednesday afternoon to continue meeting almost non-stop together at the Israeli Embassy. Several key officials also met with special Mideast envoy George Mitchell and other key administration officials. The team finally left for Israel late Wednesday night. Thus far, a virtual news blackout has been imposed on President Obama’s meetings with Israeli Prime Minister Netanyahu. The good news: Netanyahu had a very good week. He looked strong and principled. He was gracious and diplomatic. And he stood his ground. He did not cave into the intense pressure from the White House and State Department. He refused to divide Jerusalem. In a masterful AIPAC speech, he calmly and clearly explained why Israel would never give up the right to build homes in her capital. He sent the U.S. and the world a straightforward and sobering message that if they don’t move quickly and decisively to stop Iran from getting the Bomb, then Israel will do it herself. He didn’t threaten. He didn’t swagger. He simply stated the facts, in their historic context, and nobody does it better than Netanyahu. What’s more, he did all this with Defense Minister Ehud Barak standing in solidarity at his side, which was important because it sent the White House — and his critics back in Israel, and enemies back in Iran — the message that the Israeli government is united. No small thing. Barak came to Camp David with Yasser Arafat in 2000 willing carve up Jerusalem and give away the West Bank. God bless Netanyahu for opposing this approach in principle, and for having and (thus far, at least) maintaining Barak’s support in the process. What’s more, the AIPAC speech, plus the warm and engaging meetings with Members of Congress significantly strengthened Netanyahu’s hand. It reconnected him in a very important way with grassroots pro-Israel activists from all over the U.S., Jews and Christians alike. It also significantly strengthened his alliance with Congress, which continues to prove itself as the pro-Israel end of Pennsylvania Avenue. Both are critical in counter-balancing the hostile Obama administration. The President and Prime Minister met twice at the White House on Tuesday night for a total of about two hours, from 5:30pm to around 7pm, and then again from about 8:30pm to 9pm. Senior aides to both leaders then stayed up until nearly 1:00am Wednesday morning continuing their talks. The White House, however, has refused to treat Netanyahu and Israeli Defense Minister Ehud Barak with the dignity and respect afforded other world leaders. No joint press conferences. No photo ops. No still shots released of the two leaders meeting. Pretty much “no comment” to any of the substance. The Netanyahu team, apparently following the request of the White House and trying to be sensitive to the desire of its host, hasn’t been talking either. On Wednesday morning, the Israelis canceled all interviews. Several news outlets have noted the silence related to the talks is “deafening,” and I agree. It’s hard to remember the last time a world leader of Netanyahu’s caliber — particularly a strong friend and ally of the United States — was subject to such treatment from an administration that claims to be hitting the “reset” button to improve relations between the two countries. Except for last year when Netanyahu came to Washington and also met with Obama without a photo op, press conference, or any of the diplomatic trappings of mutual respect and true friendship. I believe that Netanyahu was wise to cancel his media interviews on Wednesday. He didn’t grandstand. He didn’t purposefully stick his finger in the President’s eye. Having effectively made his public case to AIPAC and Congress on Monday and Tuesday, Netanyahu, Barak and their team worked hard on Wednesday to show the administration their willingness to negotiate in good faith, and to do so without immediately and publicly airing their differences with the administration. That said, Netanyahu and his team should soon do many media interviews with U.S. and foreign media. He should also dispatch senior government officials to speak to Jewish and Christians groups throughout the U.S. in the weeks and months ahead. He has the support of the American people, but he should never take that for granted. Prophetically, I believe Israel will eventually be isolated from all countries in the world, especially as we approach the fulfillment of Ezekiel 38 & 39. Eventually, the Lord will wean Israel off of every nation – including the U.S. – so that the Jewish people only have Him to turn to and depend upon. That said, however, the Scriptures are clear in Genesis 12:1-3 and elsewhere that those who bless Israel, He will bless, and those who curse Israel, He will curse. We want our countries to be blessed by God, to experience repentance and revival and to be blessings to the rest of the world. Now, therefore, is the most critical time for true followers of Jesus Christ to show unconditional love and unwavering support to Israelis and to their Palestinian neighbors. We need to pray for the peace of Jerusalem. We need to show the love of Jesus to every Jew and Gentile in the Holy Land. And we need to strengthen the Church in the epicenter, encourage pastors and ministry leaders, and help them fulfill Isaiah 60:1-4. The good news is: the God of Israel neither sleeps, nor slumbers. He is in charge. He is watching over His people to protect them. But He calls on us to pray for the peace of Jerusalem, to educate Christians around the world about God’s love and plan for Israelis and Palestinians, and to care for both sides in real and practical ways, including food, clothing, medical supplies, and other forms of humanitarian aid. This is what The Joshua Fund is trying to do. We’re so grateful for your prayers and financial support. This is a critical moment for followers of Jesus Christ. May we be faithful to the Lord until He returns. National Review Online has posted the following article. It is adapted from the weblog article I posted Tuesday morning, but there are a few significant differences, including an analysis of Netanyahu’s new strategy to rebuild U.S.-Israeli relations. Washington Post front page story reports the sharp contrast between how Netanyahu is being received by the White House (cold) and by Congress (hero): Visiting Israeli Prime Minister Binyamin Netanyahu received warm applause at the American Israel Public Affairs Committee (AIPAC) conference on Monday night when he bluntly dismissed U.S. demands to end housing construction in the disputed part of Jerusalem. He was greeted as a hero when he visited Capitol Hill on Tuesday. But the administration has been strikingly muted in its reception. 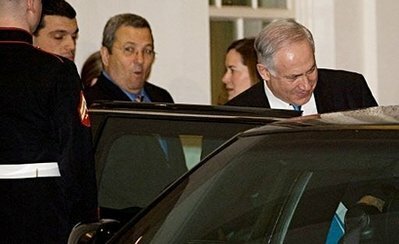 No reporters, or even photographers, were invited when Netanyahu met with Secretary of State Clinton Hillary Rodham Clinton and Vice President Biden on Monday or when he met with Obama on Tuesday night. There was no grand Rose Garden ceremony. Official spokesmen issued only the blandest of statements. 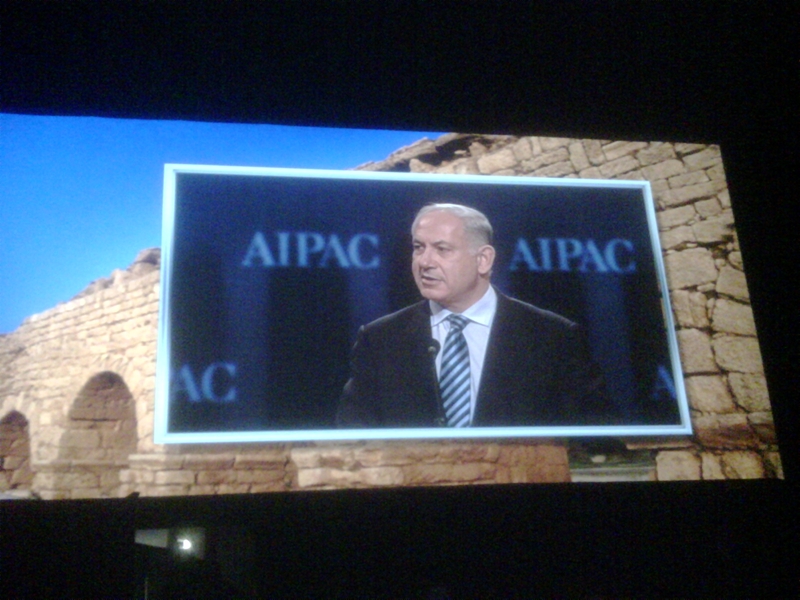 Netanyahu addressed the AIPAC gala dinner on Monday. 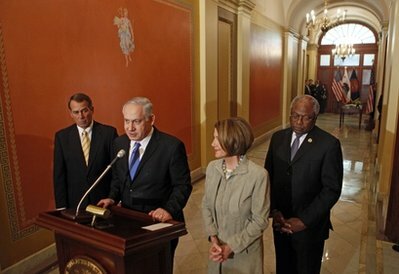 Netanyahu met with Congressional leaders on Tuesday. Most stunning line of the night: Sen. Chuck Schumer (D-New York) said unequivocally that when it comes to Iran, “Diplomacy has failed.” We all know this to be true, to be sure, but I have not yet heard it said by such a high-ranking Democrat and close supporter of President Obama. Most sobering speech of the night: Sen. Lindsey Graham (R-South Carolina) said this could be the last annual AIPAC conference before Iran gets the Bomb, and said the U.S. needs to urgently prepare for the possibility of launching massive airstrikes to stop Iran. My wife, Lynn, and I had the honor of attending the event with the incoming chairman of The Joshua Fund and his wife. It was the largest dinner in the organization’s history, with 7,800 guests, including more than half of the Members of the United States Senate, more than half of the Members of the House of Representatives, and ambassadors from at least 55 countries. What follows are key quotes and some analysis from the night’s event. But first let me make two points. First, just a few years ago, the leadership of AIPAC (the American Israel Public Affairs Committee) decided to make a conscious effort to reach out to pro-Israel evangelical Christian leaders and activists, and I am so glad they did. Last night, I’m told, there were 130 evangelical leaders present to show unconditional love and unwavering support to the Jewish people and the State of Israel. I hope that more Christians choose to attend AIPAC conferences in the future. We met numerous religious and secular Jews last night (as we did last year) who are profoundly grateful for the support of evangelicals. One Orthodox Jewish woman told my wife and me, “You Christians are the best friends Israel has. You’re the only friends we really have.” She was deeply moved, as were we. Second, we want to reciprocate and invite Jewish and Israeli leaders to the 2010 Epicenter Conference this summer in Philadelphia (June 25-26) to work together to bless Israel at this critical moment in history. We have already sent invitations to several high-ranking Israeli leaders to come and address the conference. We are hopeful that the Prime Minister’s government will send a high-ranking representative. We will also do more in the coming weeks to reach out to rabbis and other leaders and grassroots activists within the Jewish community. We hope you will join us as well, and invite your Christian and Jewish friends to attend. For more details, please go to www.epicenterconference.com. WHAT WILL HAPPEN IF THE WORLD DOES NOT STOP IRAN? Netanyahu called on the world to act swift “to act swiftly and decisively to thwart this danger,” but he made it clear that if the world does not stop Iran, Israel will. WHAT HAVE THE PALESTINIAN LEADERS DONE FOR PEACE? WHY DOES ISRAEL FACE A “TRIPLE STANDARD”? Going off text, he then asked why Israel faces a “triple standard” in the world. There is, he said, one standard for dictatorships, another for democracies, and a third for Israel. A case in point, of course, is the U.N.’s pernicious and anti-Semitic Goldstone Commission Report which condemns Israel for committing so-called “war crimes” for defending her innocent civilians from 10,000-plus rocket attacks from Hamas terrorists in Gaza while for years the U.N. did nothing to stop those rocket attacks and barely holds Hamas to account for those attacks. Graham’s speech was the most sobering and candid I have ever heard at AIPAC over the years. He bluntly warned that “time is not on our side” with Iran, and he asked, Will this be the last AIPAC meeting before Iran gets the Bomb? He said he did not know, but that while no one wants war, the U.S. should prepare for massive airstrikes soon, should diplomacy and sanctions failed to stop Iran’s leaders in time. I’ve seen no coverage of Graham’s speech and have not yet found a transcript of it. But I will post both when and if they are published. Sec. 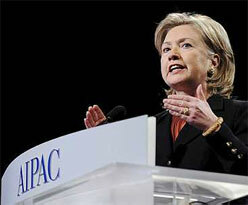 Clinton addressed AIPAC Monday morning. Israeli PM Netanyahu has arrived in the U.S. with Defense Minister Ehud Barak…at 2:30pm today they will meet with Secretary of State Clinton, and later with Defense Secretary Gates….tonight, Netanyahu will have dinner with Vice President Biden….then he will cross town to address the AIPAC gala dinner at the Washington Convention Center where some 7,500 pro-Israel activists, Congressional leaders, business leaders, students and journalists are expected….Lord willing, Lynn and I will be there with the incoming chairman of The Joshua Fund and his wife….Tuesday, the PM is expected to meet with President Obama at the White House, and with Congressional leaders….on Wednesday, he will do U.S. media interviews, and then fly back to Israel…..please pray for safety for the PM and his team on this trip….pray, too, for the Lord to heal the U.S.-Israeli relationship, avert the train wreck that is currently in motion, and for the Lord to give the PM and his team wisdom and courage to do and say the right things at the right times. Thanks. Please keep the Israeli Prime Minister and his team in your prayers as they fly to Washington. Please pray that the Lord would give them safety and wisdom for the AIPAC speech tomorrow night and in their meetings with the President, VP, Secretary of State and Congressional leaders. Please particularly pray that the Lord would give the PM the courage to resist the administration’s intense pressure to divide Jerusalem and further divide the Holy Land.